Sachin Tendulkar will play his 170th Test at Mohali on Friday, but even after over 20 years in international cricket the senior India batsman says he never takes anything for granted, his success is a reflection of his constant hard work. "There are ups and downs when you complete a circle of life; it's not always about being on the top. In life there are ups and downs, but it's important to complete that circle and that's what has happened in my career," Tendulkar said on the sidelines of the unveiling of the Nike apparel for Team India. Tendulkar, Virender Sehwag, Gautam Gambhir, Harbhajan Singh, Zaheer Khan and Pragyan Ojha donned the new clothing, which will be their official attire in the upcoming ODI series against Australia. Tendulkar, who was put questions by cricket commentator Harsha Bhogle at the function, said there are no short cuts to success. "I don't want to take anything for granted. I have worked hard over the years to be part of the Indian team. "The key thing is to continue to work hard and try and get better each day of the life and make sure that you enjoy every moment and that's what I try to do," the 37-year-old said. Asked how old was he when he started playing cricket, Tendulkar said, "I don't want to talk about that, but as long as I am enjoying, it's wonderful to be here (I will continue to play)." Asked about the five-Test match series that used to be played earlier, Tendulkar said, "I think given the current schedule, it's going to be difficult to accommodate that ... it will take a mega effort to organise it (such a series)." "It requires a different temperament altogether. Sometimes you start the series brilliantly, but don't end up that well. Sometimes, you start badly, but end up becoming man of the series. It's a great learning curve," he said. 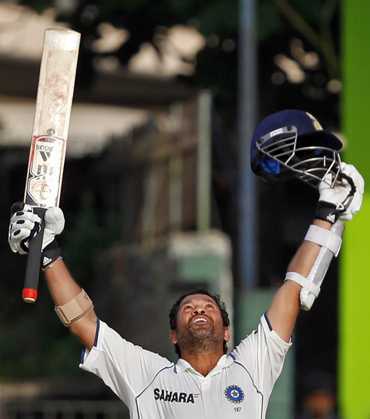 Tendulkar has most batting records under his belt and is on the verge of reaching 14,000 runs in Test cricket. Closely following him is Australian skipper Ricky Ponting with 12,026 runs but Tendulkar said he doesn't want to talk about records. "I don't like to talk about records, let others talk about it. I will keep scoring runs," he said. Swashbuckling opener Sehwag said people may not think that he's been around playing cricket for India for a decade now, but it was his receding hairline which drops the hint. 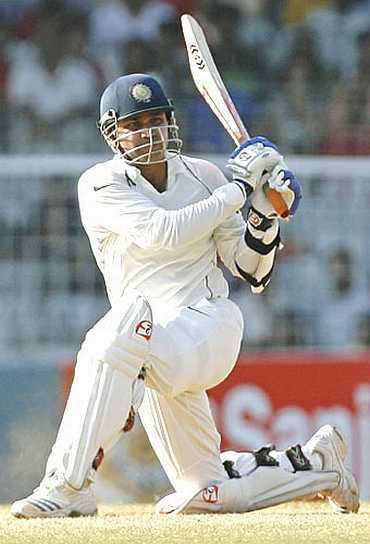 "Baal ud gayeen hein to lagta hein (hairline has gone down, therefore it looks I'm rich in experience)," said Sehwag, who will be making his 80th Test appearance in the Mohali Test on Friday. Sehwag, who has two triple tons to his credit in Tests, said he looks more fitter these days "because when you score big hundreds, you lose fat and gain energy". "I always give my 100 per cent and it doesn't matter if I score or not," added the Delhi batsman, who has featured in 228 ODIs for India. Asked if it is difficult to make the transition from one format to another, Sehwag said, "I play with the same mindset, which is to enjoy my cricket. 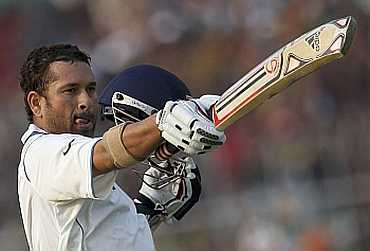 My mindset is to score runs and that remains the same." Also present on the occasion, Harbhajan Singh dispelled the impression that he has become a "defensive bowler". "People say many things about me. They may be right when they say I have become batsman because I score runs, but they are wrong when they say I have become a defensive bowler. I am an attacking bowler and I will always play that way," the off-spinner said. Harbhajan is always at his aggressive best against Australia and has figured in many a confrontation with the Aussies. Asked why is it that his name crops up whenever an Aussie talks about any Indian cricketer, he quipped: "Because they love me so much. I have so many friends in Australia and whenever I play against the Aussies and perform, I feel good." "I will try to perform even better this time so that next time when the next series happens they (Aussies) should again take my name first," said Harbhajan. Rising spinner Ojha, meanwhile, rated Harbhajan as his role model, saying he would like to emulate him. Gambhir said he is looking forward to the challenge against Australia. Zaheer Khan said that he spends a lot of time on his fitness these days and also talked about the importance of having a good sports gear to wear. "It's important to have the right gear which does not stick to your skin in the hot and humid conditions. Definitely, I think the right clothing helps you perform better and makes you feel better," Zaheer, who is rated highly by the Aussies for his lethal bowling and reverse swing capability, said. He said with the upcoming schedule being packed he spends a lot of time on fitness. "I am at a stage where I need to build my bowling fitness and I am doing just that," he said.